Jacobi onstage performing A Voyage Round My Father at Wyndham's Theatre, London (December 2006). In addition to being a founder member of the Royal National Theatre and winning several prestigious theatre awards, Jacobi has also enjoyed a successful television career, starring in the critically praised adaptation of Robert Graves's I, Claudius (1976), for which he won a BAFTA; in the titular role in the medieval drama series Cadfael (1994–1998), as Stanley Baldwin in The Gathering Storm (2002), as Stuart Bixby in the ITV comedy Vicious (2013–2016) and as Alan Buttershaw in Last Tango in Halifax (2012–present). Though principally a stage actor, Jacobi has appeared in a number of films, including The Day of the Jackal (1973), Henry V (1989), Dead Again (1991), Gladiator (2000), Gosford Park (2001), The Riddle (2007), The King's Speech (2010), My Week with Marilyn (2011), and Cinderella (2015). He holds a British knighthood and has been appointed a Knight First Class of the Order of the Dannebrog. Jacobi, an only child, was born in Leytonstone, London, England, the son of Daisy Gertrude (née Masters), a secretary who worked in a drapery store in Leyton High Road, and Alfred George Jacobi, who ran a sweet shop and was a tobacconist in Chingford. His great-grandfather on his father's side had emigrated from Germany to England during the 19th century. His family was working class. Jacobi describes his childhood as happy. In his teens he went to the Leyton Sixth Form College and became an integral part of the drama club, The Players of Leyton. While in the sixth-form, he starred in a production of Hamlet, which was taken to the Edinburgh Festival Fringe and very well regarded. At 18 he won a scholarship to the University of Cambridge, where he read history at St John's College and earned his degree. Younger members of the university at the time included Ian McKellen (who had a crush on him – "a passion that was undeclared and unrequited", as McKellen relates it) and Trevor Nunn. During his studies at Cambridge, Jacobi played many parts including Hamlet, which was taken on a tour to Switzerland, where he met Richard Burton. As a result of his performance of Edward II at Cambridge, Jacobi was invited to become a member of the Birmingham Repertory Theatre immediately upon his graduation in 1960. After eight years at the National Theatre, Jacobi left in 1971 to pursue different roles. In 1972, he starred in the BBC serial Man of Straw an adaptation of Heinrich Mann's book Der Untertan, directed by Herbert Wise. Most of his theatrical work in the 1970s was with the touring classical Prospect Theatre Company, with which he undertook many roles, including Ivanov, Pericles, Prince of Tyre and A Month in the Country opposite Dorothy Tutin (1976). Jacobi was increasingly busy with stage and screen acting, but his big breakthrough came in 1976 when he played the title role in the BBC's series I, Claudius. He cemented his reputation with his performance as the stammering, twitching Emperor Claudius, winning much praise. In 1979, thanks to his international popularity, he took Hamlet on a theatrical world tour through England, Egypt, Greece, Sweden, Australia, Japan and China, playing Prince Hamlet. He was invited to perform the role at Kronborg Castle, Denmark, known as Elsinore Castle, the setting of the play. In 1978 he appeared in the BBC Television Shakespeare production of Richard II, with Sir John Gielgud and Dame Wendy Hiller. In 1980, Jacobi took the leading role in the BBC's Hamlet, made his Broadway debut in The Suicide (a run shortened by Jacobi's return home to England due to the death of his mother), and joined the Royal Shakespeare Company (RSC). From 1982 to 1985 he played four demanding roles simultaneously: Benedick in Shakespeare's Much Ado About Nothing, for which he won a Tony for its Broadway run (1984–1985); Prospero in The Tempest; Peer Gynt; and Cyrano de Bergerac which he brought to the US and played in repertory with Much Ado About Nothing on Broadway and in Washington DC (1984–1985). In 1986, he made his West End debut in Breaking the Code by Hugh Whitemore, starring in the role of Alan Turing, which was written with Jacobi specifically in mind. The play was taken to Broadway. In 1988 Jacobi alternated in West End the title roles of Shakespeare's Richard II and Richard III in repertoire. He was appointed the joint artistic director of the Chichester Festival Theatre, with the West End impresario Duncan Weldon in 1995 for a three-year tenure. As an actor at Chichester he also starred in four plays, including his first Uncle Vanya in 1996 (he played it again in 2000, bringing the Chekhov play to Broadway for a limited run). Jacobi's work during the 1990s included the 13-episode series TV adaptation of the novels by Ellis Peters, Cadfael (1994–1998) and a televised version of Breaking the Code (1996). Film appearances included performances in Kenneth Branagh's Dead Again (1991), Branagh's full-text rendition of Hamlet (1996) as King Claudius, John Maybury's Love is the Devil (1998), a portrait of painter Francis Bacon, as Senator Gracchus in Gladiator (2000) with Russell Crowe, and as "The Duke" opposite Christopher Eccleston and Eddie Izzard in a post-apocalyptic version of Thomas Middleton's The Revenger's Tragedy (2002). Jacobi has narrated audio book versions of the Iliad, The Voyage of the Dawn Treader by C. S. Lewis, Farmer Giles of Ham by J. R. R. Tolkien, and two abridged versions of I, Claudius by Robert Graves. In 2001 he provided the voice of "Duke Theseus" in The Children's Midsummer Night's Dream film. In 2002, Jacobi toured Australia in The Hollow Crown with Sir Donald Sinden, Ian Richardson and Dame Diana Rigg. Jacobi also played the role of Senator Gracchus in Gladiator and starred in the 2002 miniseries The Jury. He is also the narrator for the BBC children's series In the Night Garden. In 2004 Jacobi starred in Friedrich Schiller's Don Carlos at the Crucible Theatre in Sheffield, in an acclaimed production, which transferred to the Gielgud Theatre in London in January 2005. The London production of Don Carlos gathered rave reviews. Also in 2004, he starred as Lord Teddy Thursby in the first of the four-part BBC series The Long Firm, based on Jake Arnott's novel of the same name. In Nanny McPhee (2005), he played the role of the colourful Mr. Wheen, an undertaker. He played the role of Alexander Corvinus in the 2006 movie Underworld: Evolution. In February 2007, The Riddle, directed by Brendan Foley and starring Jacobi, Vinnie Jones, and Vanessa Redgrave, was screened at Berlin EFM. Jacobi plays twin roles: first a present-day London tramp and then the ghost of Charles Dickens. In March 2007, the BBC's children's programme In the Night Garden... started its run of one hundred episodes, with Jacobi as the narrator. He played Nell's grandfather in ITV's Christmas 2007 adaptation of The Old Curiosity Shop, and returned to the stage to play Malvolio in Shakespeare's Twelfth Night (2009) for the Donmar Warehouse at Wyndham's Theatre in London. The role won him the Laurence Olivier Award for Best Actor. He appears in five 2009 films: Morris: A Life with Bells On, Hippie Hippie Shake, Endgame, Adam Resurrected and Charles Dickens's England. In 2010 he returned to I, Claudius, as Augustus in a radio adaptation. In 2011, he was part of a medieval epic, Ironclad, which also starred James Purefoy and Paul Giamatti, as the ineffectual Reginald de Cornhill, castellan of Rochester castle. Jacobi starred in Michael Grandage's production of King Lear (London, 2010), giving what The New Yorker called "one of the finest performances of his distinguished career". In May 2011 he reprised this role at the Brooklyn Academy of Music. In April 2012 he appeared in Titanic: Blood and Steel and in November 2012 he starred in the BBC series Last Tango in Halifax. In 2013 he starred in the second series of Last Tango and in 2014 the third series. In 2011, Jacobi accepted a role in the film Anonymous, about the Oxfordian theory, starring Rhys Ifans and Vanessa Redgrave. In the film Jacobi narrates the Prologue and Epilogue, set in modern-day New York, while the film proper is set in Elizabethan England. Jacobi allows that making the film was "a very risky thing to do", and imagines that "the orthodox Stratfordians are going to be apoplectic with rage". Jacobi is openly gay. In March 2006, four months after civil partnerships were introduced in the United Kingdom, Jacobi registered his civil partnership with Richard Clifford. They live in Primrose Hill, North London. He was a Grand Marshal of the 46th New York City Gay Pride March in 2015. 1 2 "Jacobi, Sir Derek". Encyclopædia Britannica's Guide to Shakespeare. Encyclopædia Britannica, Inc. 2008. Retrieved 4 April 2008. 1 2 Wheatley, Jane (18 December 2008). "First knight of nerves for Derek Jacobi and A Bunch of Amateurs". The Times. London. Retrieved 1 May 2010. ↑ "Derek Jacobi Credits, Broadway". Internet Broadway Database. Retrieved 8 July 2015. ↑ "Derek Jacobi Biography". FilmReference.com. Retrieved 4 September 2011. ↑ Farndale, Nigel (2 July 2012). "Derek Jacobi: 'I don't mind people having faith. But it ain't for me'". The Telegraph. Retrieved 24 August 2015. ↑ "Derek Jacobi Biography (1938–)". filmreference. 2008. Retrieved 4 April 2008. ↑ Rees, Jasper (15 July 2002). "Crown him with many crowns". The Daily Telegraph. London. Retrieved 4 April 2008. ↑ Vincent, Sally (19 September 2006). "I already knew I was a tetchy beast". The Guardian. London. Retrieved 4 April 2008. ↑ Wheatley, Jane (18 December 2008). "First knight of nerves for Derek Jacobi and A Bunch of Amateurs". The Times. ↑ Steele, Bruce C. (11 December 2001). "The Knight's Crusade: playing the wizard Gandalf in The Lord of the Rings may make Sir Ian McKellen the world's best-known gay man. And he's armed and ready to carry the fight for equality along with him". The Advocate. pp. 36–38, 40–45. ↑ "'Ello, 'Ello, 'Ello". Doctor Who. Season 3. Episode 40. BBC. ↑ Billings, Joshua (9 February 2009). "Star-Crossed". Oxonian Review (8.3). ↑ "Olivier awards 2009: the winners". WhatsonStage.com. 9 March 2009. Retrieved 8 July 2015. ↑ Lahr, John (3 January 2011). "Crazy Love". The New Yorker: 74–75. Retrieved 8 May 2011. ↑ Brantley, Ben (5 May 2011). "Fantasies Aside, Life's Tough At the Top". The New York Times. Retrieved 7 May 2011. ↑ "'Vicious' renewed for second series by ITV, 'Job Lot' moving to ITV2". Digital Spy. 23 August 2013. Retrieved 7 September 2013. ↑ Thorpe, Vanessa (9 September 2007). "Who Was Shakespeare? That Is (Still) the Question: Campaign Revives Controversy of Bard's Identity". The Observer. ↑ Horwitz, Jane (9 June 2010). "Backstage: What the Stars Had to Get Over to Get their 'Goat' on at Rep Stage". The Washington Post. ↑ Jacobi, Derek. "Address to the Shakespeare Authorship Research Centre at Concordia University". Concordia University (Oregon). Retrieved 8 July 2015. ↑ Malim, Richard, ed. (2004). Foreword. Great Oxford: Essays on the Life and Work of Edward De Vere, 17th Earl of Oxford, 1550–1604. Parapress Limited. p. 3. ISBN 978-1898594796. ↑ Anderson, Mark (3 August 2006). "Shakespeare" by Another Name: The Life of Edward de Vere, Earl of Oxford, the Man Who Was Shakespeare. Gotham Books. pp. xxiii–xxiv. ISBN 978-1592401031. (subscription required (help)). 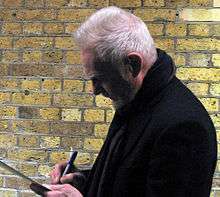 ↑ "Sir Derek Jacobi: Equal marriage debate a 'squabble over nothing'". Pink News. 3 July 2012. Retrieved 8 July 2015. ↑ Farndale, Nigel (2 July 2012). "Derek Jacobi: 'I don't mind people having faith. But it ain't for me'". The Daily Telegraph. Retrieved 8 July 2015. ↑ Itzkoff, Dave (26 June 2015). "Ian McKellen and Derek Jacobi in a Gay Pride March Debut". The New York Times. Retrieved 8 July 2015. ↑ The London Gazette: no. 53527. p. 2. 30 December 1993. Retrieved 21 November 2007.